Many people consider the human brain to be the most complex biological structure in the world. So that raises the question, is building the brain the most complex process in the world? It may well be, but researchers are making progress mimicking the earliest steps of building the brain in a lab dish. A review written by Dr Karus, Dr Blaess and Prof Dr Brüstle in The Journal of Comparative Neurology describes how stem cells are being used to grow cell structures resembling parts of a growing brain. Researchers are able to create structures that contain different neurons, have organised layers of cells, and produce many of the same proteins as a developing human brain. This review shows why stem cells offer new opportunities to understand complex processes involved with the early stages of human brain development and problems that might lead to developmental disorders and birth defects. What is the background behind this review? Building the brain is a miraculous achievement of biology. The human brain is made up of over 100 billion cells, which are created at specific times and in specific places. Once made, different types of cells must move, arrange themselves into complex structures, form connections, and work together to make functioning brain tissue. Different regions of the brain have specialised functions and therefore require different cell types and cell arrangements. There’s a lot going on. This can be overwhelming to think about, but the truly amazing part is that the brain actually starts off very simple - as a single layer of cells. The cells forming the ‘rosette structures’ shown in this image are ‘long-term neuroepithelial stem cells’. The first image (A) shows the cells using only light, a method called ‘phase-contrast imaging’. The second image (B) uses a method called immunostaining to label specific proteins using fluorescent molecules attached to antibodies. Here the cells are stained for proteins SOX2 (blue) and nestin (red). For years researchers have studied how this layer of future brain cells, called ‘neuroepithelial cells’, grows and creates the brain in animals, such as rats and mice. This has allowed scientists to learn a lot about brain development in general, but cannot reveal details specific to human brain formation. Directly studying the earliest steps of human brain development is difficult and controversial because of ethical issues and strict government regulations on all scientific studies involving human embryos and embryo-derived cells. A discovery in 2008 by Elkabetz and colleagues suggested that ‘neural stem cells’ may offer an alternative way to study human brain development. Neural stem cells are important for building the brain because they give rise to many cells found in the nervous system. Elkabetz and colleagues’ discovery was that neural stem cells have the ability to arrange themselves into circles or ‘rosette patterns’ in a lab dish (right). These rosettes have similarities to the layer of neuroepithelial cells that create the brain. This opened a new approach to studying early human brain development. Furthermore, if researchers create the neural stem cells from induced pluripotent stem cells, it should be possible to avoid the controversy associated with studying cells from human embryos. This approach should provide researchers with more experimental control and freedom to test theories about the earliest stages of human brain development. What points did the review present? Dr Karus and colleagues discuss the neural stem cell ‘rosettes’ created by Elkabetz and colleagues as well as subsequent studies examining the specific conditions that promote neural stem cells to make rosettes. Neural stem cells in the brain are directed by specific proteins, signals and growing conditions to create the many different cells needed to build the brain. In the laboratory, scientists can compare and contrast many different types of growing conditions to try and recapitulate what happens naturally. Researchers studying neural stem cell rosettes eventually determined several conditions that created different types of neurons and other brain cells in the cell rosettes. Some of these cells aligned themselves into loosely defined layers. These layers roughly resemble the cell layers in a region of the brain called the ‘cortex’, which is the part of the brain allowing us to think, remember, process sensory information like sight and sound, and more. The observations that neural stem cells can form rosette patterns and mimic layers of the cortex suggested to researchers that the cells might be able to make even more complex structures than rosette patterns. This image shows a cerebral organoid that was made from human induced pluripotent stem cells. This organoid contains large looping layers of neurons and brain cells, similar to the cortical region of a developing brain. The cells are immunostained to identify the presence of proteins SOX2 (red) and beta-III-Tubulin (green). The latter protein is made specifically in neurons and is often used by scientists to identify neurons from other brain cells. The blue stain is called DAPI and is used to locate the nucleus of cells. Several laboratories, including Professor Brüstle’s laboratory, found that growing neural stem cells in systems where cells freely float in liquid (3D culture systems) resulted in clusters of cells with loosely defined cell layers. Although these cell clusters had rather ‘primitive’ structural layers, they were producing many of the same proteins that are made by brain cells in 10-week-old human foetuses. Lancaster and colleagues in 2013 moved the 3D culture system to a new level by growing the neural stem cells in a bioreactor. This system allowed neural stem cells to create complex layers of different neurons and other brain cells, very similar to tissue found in human foetal brains. Lancaster and colleagues call the complex cell structures they made ‘cerebral organoids’ (roughly meaning ‘resembling a brain-like organ’). Some cerebral organoids even appear to have neurons that move to new locations after they are created, similar to how neurons in the developing human brain must migrate from one place to another to form the complex layers of the cortex. Other advances in understanding how stem cells function and grow have even allowed Eiraku and colleagues to produce the very early stages of a forming eye, called an ‘optic cup’. Dr Karus and colleagues’ review highlights that stem cells offer researchers the opportunity to unlock the biological programs tucked away inside our cells, programs that guide self-driven assembly of advanced cell structures like optic cups and cell layering in cerebral organoids. What does this mean for patients and others interested in this research? Researchers are presently considering how to use human brain-like tissues constructed from pluripotent or neural stem cells to study several diseases and medical treatments. In fact, cerebral organoids have recently been used to test if drugs and chemicals are toxic to brain tissue, which could be a valuable safety measure before trying drugs on animals and people. It is exciting that studies on neural stem cells are already producing useful applications like this. However, the biggest gains from the use of neural stem cells will likely be in understanding the basic biology controlling human brain development. Future discoveries that teach us about how the human brain is built will help us understand what causes birth defects, brain development disorders like cerebral palsy, mental disorders and more. 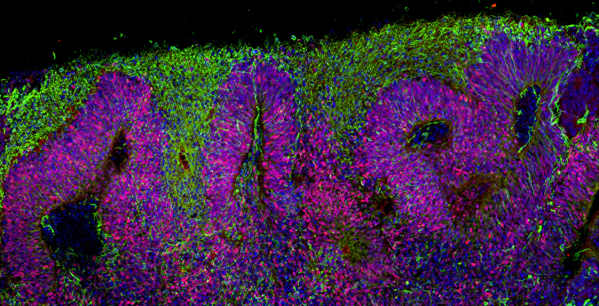 Cerebral organoids offer a great new approach for studying the earliest stages of human brain development, but researchers will have to use a diversity of new and old scientific approaches to fully learn how the brain is constructed. They will also have to determine how the brain’s cellular structure relates to the behaviour of animals and people – a very challenging task. Unlocking the secrets of how our brain is built and works will certainly transform science and medicine forever, but achieving this will take many years of hard work. After all, we’re learning how biology builds the most complex structure in the world. This summary is based on the original article ‘Self-organization of neural tissue architectures from pluripotent stem cells’ by Michael Karus, Sandra Blaess and Oliver Brüstle, The Journal of Comparative Neurology 2014. A journal subscription may be required for access. Cerebral Palsy, a general term for neurological disorders caused by problems in brain development. Recent advances: Ohio State University Researchers Present Most Advanced Brain Organoid Yet; reported by Ohio State University and WIRED.com. Brain development studies reveal where neurons affected by Huntington’s disease are created. More on the optic cup research. Written by Ryan Lewis, edited by Jan Barfoot, reviewed by Prof Dr Oliver Brüstle, Dr. Sandra Blaess and Dr. Michael Karus.